Home to the broken, the dispossessed, and other scary folk. In our prayers, we mispronounce the words of the paternoster; we curse the womb of the anomalous woman; we deny Christ and the Eucharist, and we praise Pilate’s decision every Friday. Instead of fasting during Lent, we offer our bodies and souls to our master, Satan. Nineteen-year-old Josie García is torn between true love with a down-and-out poet and the monetary stability that only a rich husband can provide. She owes renttwo monthsand while her little landlady is docile enough to pretend that she has forgotten about the money, she’s also a self-taught witch, planning to chop Josie’s head off and use it as the main ingredient in a potion to recover her lost youth and become the beautiful woman she never was. 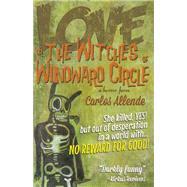 Creepy, campy, and yet incredibly lyrical, Love, or the Witches of Windward Circle is a wildly imaginative tale that spans five decades, connecting the otherworldly occult to the out-of-this-world bohemia of fiftiies Venice Beach. Carlos Allende was born in Mexico City in 1974, but can pull off 1985 under the proper light. He has three elder sisters, none of whom practices magic. Since he was kid, he knew he liked boys and that he wanted to be a writer. However, he was too much of a coward to study writing: his BA is in Economics and he has a MA in Global Management. He makes a living taking care of the finances for two vacation rental companies, one of them in Venice, CA and is currently enrolled in a Master in Media Psychology. He lives in Santa Monica with his husband.